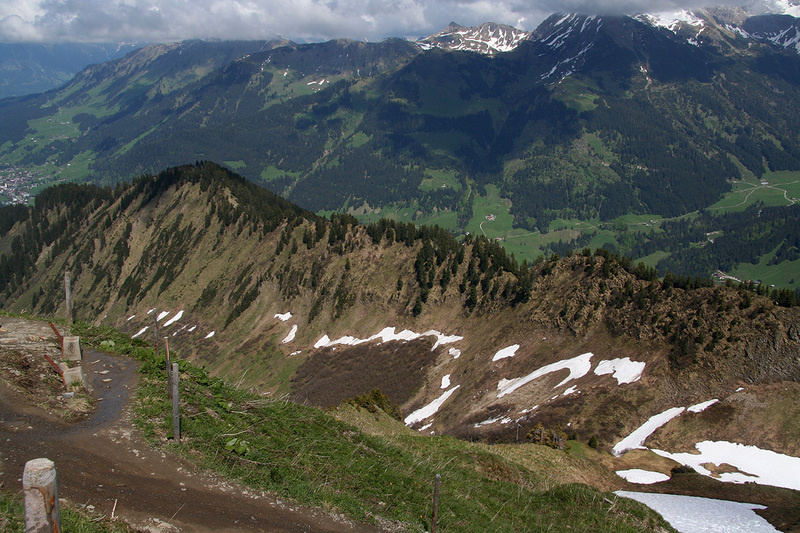 Route description: Continue uphill along the small, paved road. When you arrive at a 4-way intersection, take the left fork that descends slightly. There is a sign here, Panoramaweg and Walmendingerhorn are both correct. After a short while you arrive at the first restaurant along this way, the Sonnalp. Continue to the next restaurant, called the Bühlalpe located at 1435 meter. From here, the route is more uphill. Fork right onto a trail (leave the road) higher up and follow this trail until you reach a new trail fork just below the main ridge. Turn right and climb the last hill to the restaurant that is located just below the summit. This restaurant is also served by a gondola lift from the valley floor. 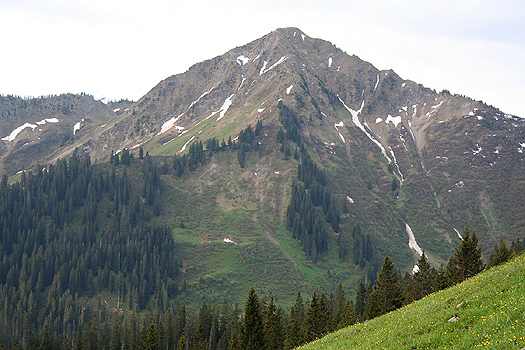 The final 3-4 short zig-zags of the trail will get you to the summit and its large summit cross. There are two alternative and shorter routes. There is a trail on the north side of the main ridge passing through the place Untere Walmendigeralpe (1424m), and a more advanced route that follows the very top of the NE ridge extending from Walmendingerhorn. See the comments below. 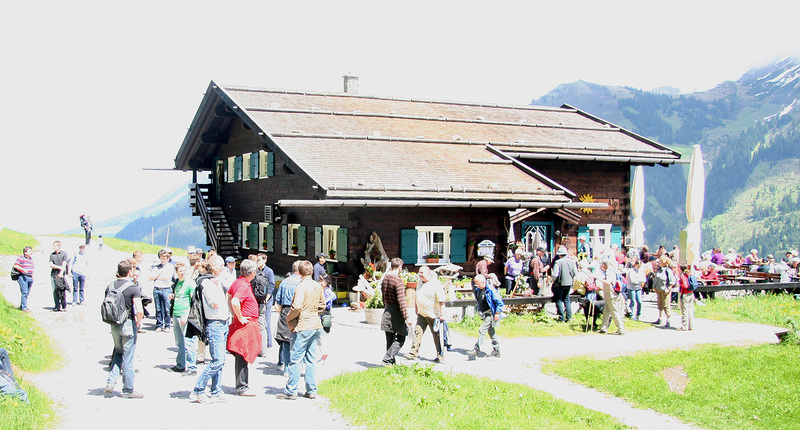 Comments: I was attending an international workshop (nicknamed DD 19.5) at the Soellerhaus, a nice place that hosts small conferences. 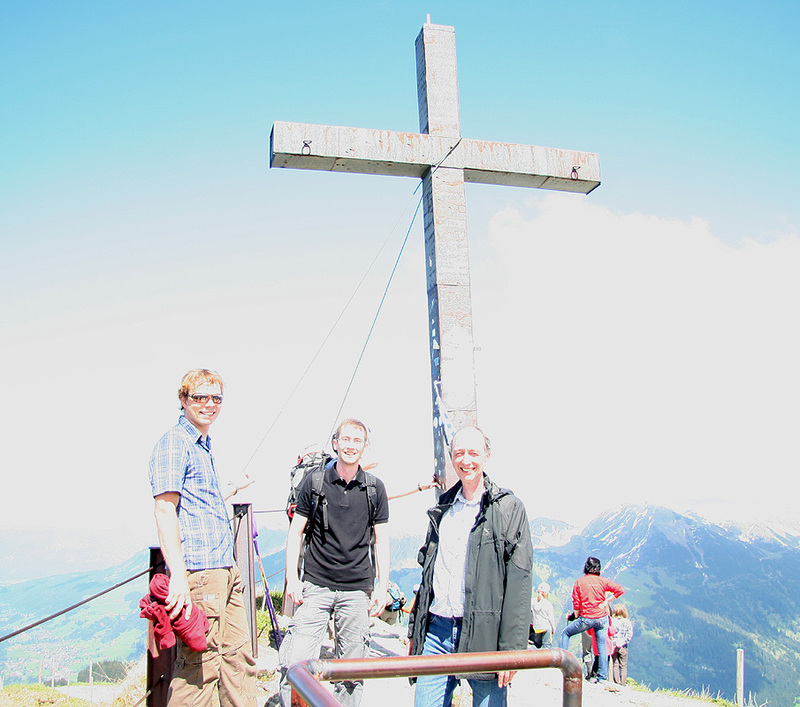 On Friday aftenoon, the program called for a hike to the local summit Walmendinger Horn, 1990 meter. 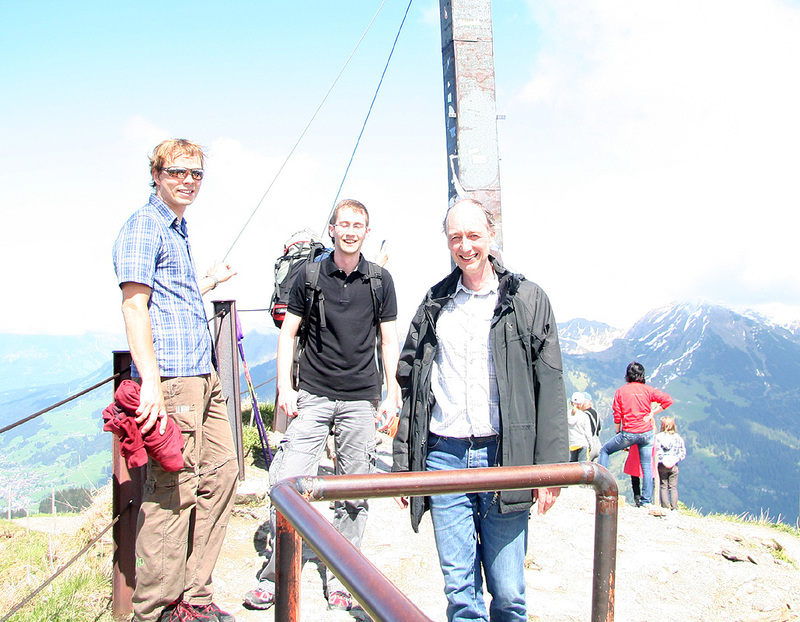 We started from Soellerhaus after lunch around 1345. 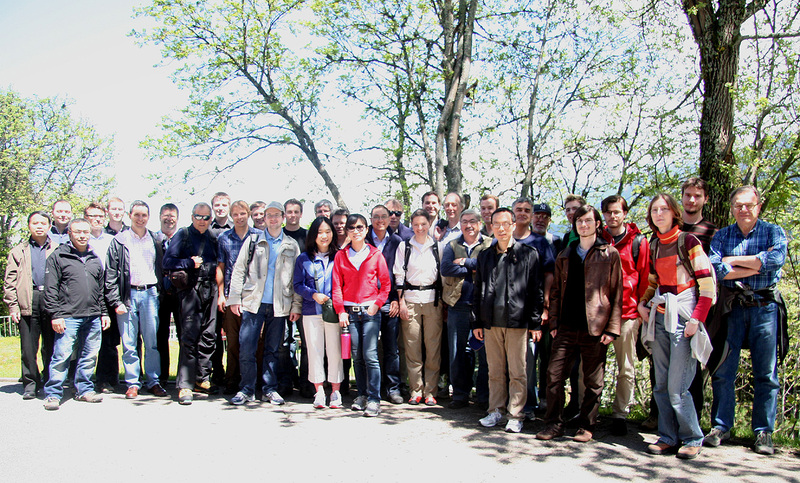 A big group, but it was clear that some would be happy reaching a restaurant along the Panorama Weg. We all had a good time, speeding up a bit as the hill got steeper (and the group smaller). We were on the summit shortly before 1530, a vey good view and everybody had a good time. We descended back down to the restaurant and enjoyed some cold drinks before thinking about the return trip. We left the summit restaurant at 1630, hiked down to the first curve and took a trail that forked left. Descending, we crossed a small snowfield, then accessed the beginning of the north-east ridge. 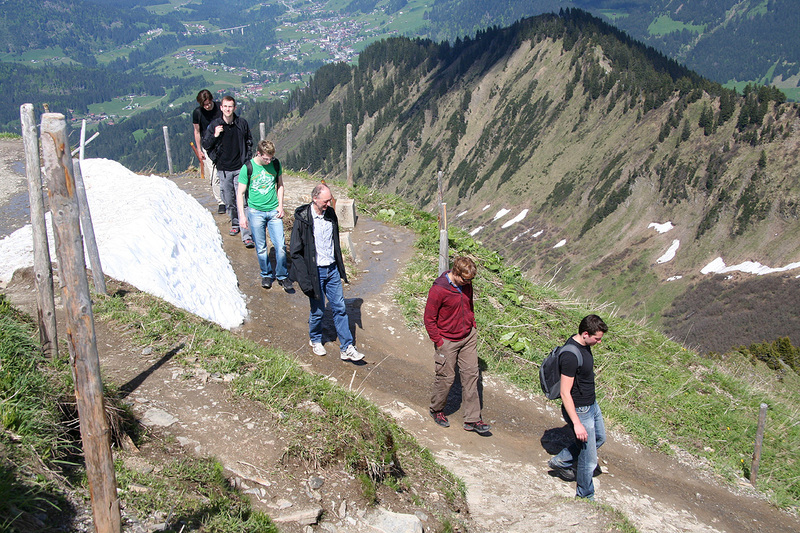 The main trail back towards Soellerhaus traverses well below the ridge (on the north side), a smaller trail continues on the very top ridge. There is a prominent sign at this fork advising that "climbing gear" is required in order to follow the top ridge. The sign explicitly says that hikers should not attempt this route. The ridge had looked interesting from the summit and Christoph Augustin (a PhD student in Graz) and I decided to give it a try, agreeing that we could turn back if it became too technical. 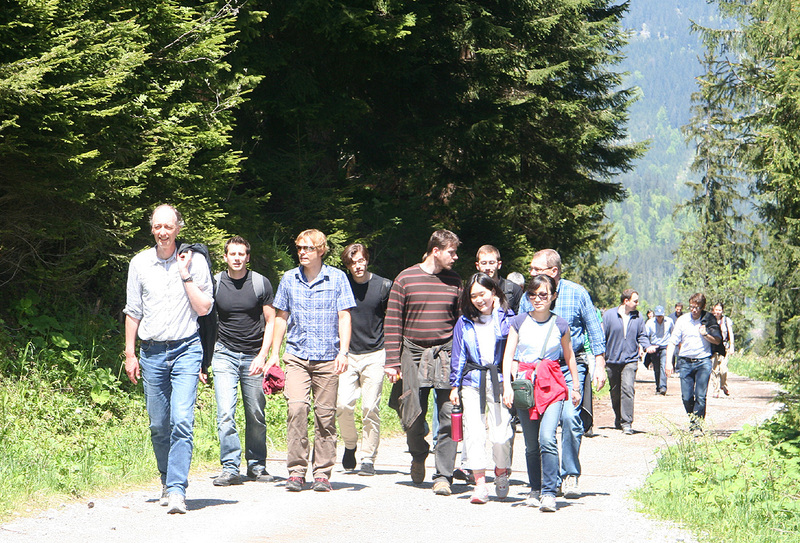 The rest of the group continued on the main trail. The ridge turned out to be very nice and entertaining. Quite a bit of air, but no big difficulties. There were two sections of slightly exposed downclimbing. Care is needed and this route is likely not nice if wet and slippery. A few loose rocks, but generally quite good footing. The ridge is somewhat easier to traverse in the opposite direction. Overall, the difficulty is mostly (YDS) class 2+, with a couple of (YDS) class 3 moves. The terrain is steep and one should not attempt this route if one is uncomfortable with exposure. Walmendingerhorn, as seen from high on Ifen. The first restaurant along the way. 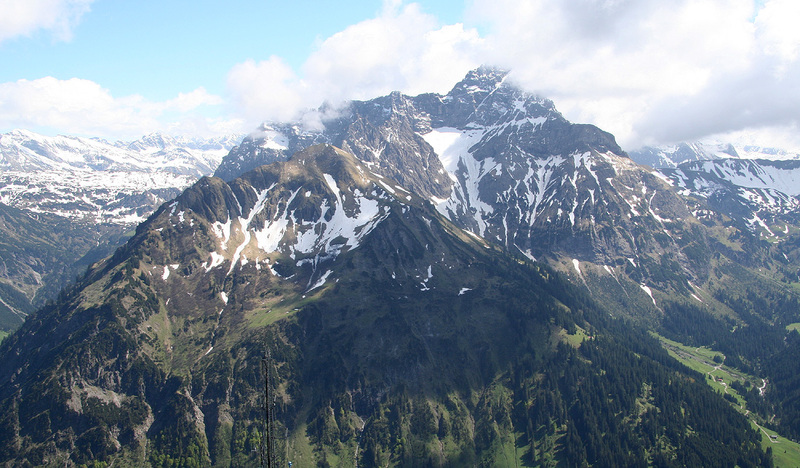 Ifen, 2230m, as seen from the summit. 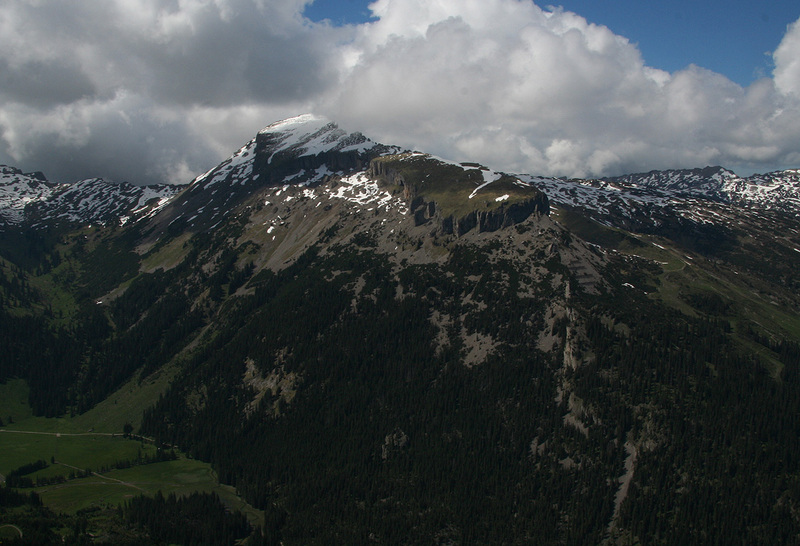 Widderhorn, 2533 m, the most prominent mountain in Kleinwalsertal. Descending, the first curve after leaving the summit. The NE ridge, as seen from the summit. We traversed this ridge on our return hike. 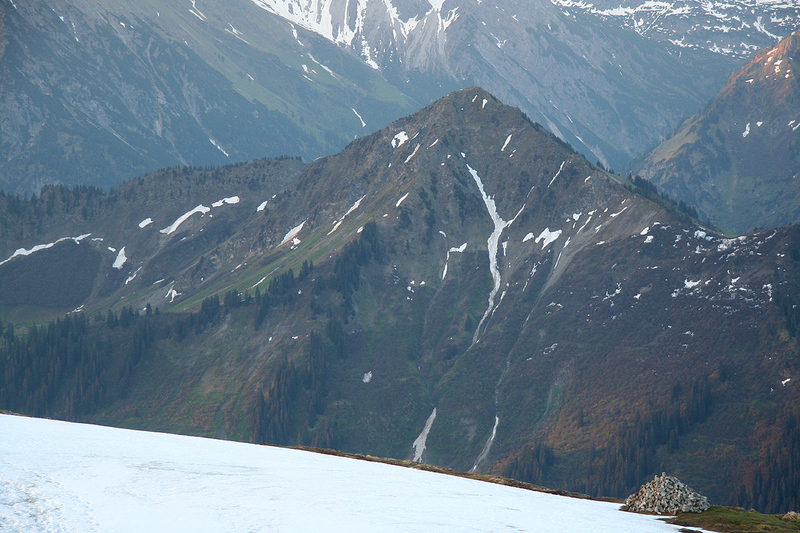 The NE ridge, as seen from the slopes of Ifen.